This is a guest post from Ruth Powell from Comhlámh, an Irish network that advises and supports hundreds of volunteers and hosting organisations that are based in Ireland. Every year more than 2000 people volunteer from Ireland to other countries around the world. The majority of them volunteer on short-term projects of four weeks or less in Sub Saharan Africa and South East Asia, in countries such as Tanzania, Uganda, Cambodia and Viet Nam. Comhlámh is the Irish association of volunteers and development workers and we provide information, training, supports and services to those people who are volunteering in the so-called Global South. The most common question we are asked by potential volunteers is “how do I know if I am volunteering effectively?” and the following would be part of our answer. Comhlámh has a code of good practice which is a set of standards that ensure responsible and responsive international volunteering practices. More than 40 volunteer sending agencies that are based in Ireland have signed up to this code. We try and provide information, support, training, and debriefing for volunteers and development workers who are working internationally. We would suggest that a volunteer should only volunteer with a sending agency that has signed up to the Comhlámh code of good practice for volunteer sending agencies. This code ensures that the volunteer sending agency is working in partnership with a locally based organisation with expertise in the field. This should ensure that the experience is mutually beneficial for the volunteer and the host community and project, and that there will be an element of learning and discovery in the experience too. But the best thing a volunteer can do to find out if the organisation they are going to volunteer with is “effective” is to ask. Ask, ask, ask. Once a potential volunteer has been through the list of 40+ Irish volunteer sending agencies, we would ask them to think about their own motivations for volunteering. We would ask them to challenge their assumptions about the placement. It is very important that the volunteering project is a part of a much bigger programme and that the volunteer delivery part of the experience is just one aspect of the overall work. Some of the best volunteer sending agencies recruit volunteers in the autumn and then spend a whole year working on team building exercises, fundraising exercises and pre-departure training. The volunteers might only travel internationally for four weeks or less, but their time working on the programme will be for over a year. We would then strongly advise that all volunteers attend either group of individual personal debriefing. If a volunteer is unsure of being able to give this type of commitment, we suggest that perhaps they should reconsider volunteering internationally at this time in their lives. We have also started to advise people that they should read a very well written book entitled “Learning Service: the essential guide to volunteering abroad” before they travel. It’s very good! The other thing to think about would be the money! Yes, the money. Short term volunteering experiences cost money, and sometimes volunteers are surprised if not absolutely shocked by this detail of the experience. This money is spent on such things as long haul flights, insurance, accommodation, food, and a percentage of it will go to the host organisation and project to support the volunteering placements. Longer term volunteering placements are different, as the volunteer is usually covered by a small weekly wage or allowance, as the time that they give balances out the costs of hosting them. But international volunteering costs money in the short term, and a potential volunteer should be aware of this. Of course, international volunteering is not really as easy as A, B, C and nor should it be. But we try to provide people with enough information before they apply for roles, so that they can seriously consider their options. Then we support them throughout their placements and when they come home, through the code, our training courses and our debriefing services. Ruth Powell is the information and support officer with Comhlámh. 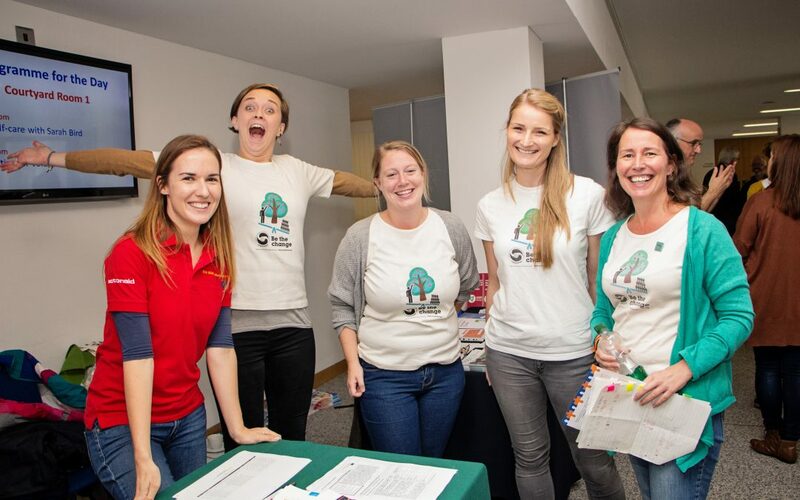 To find out more about Comhlámh please go to their website.The photo shows staff, volunteers and board members of Comhlámh attend the Irish Aid volunteer fair in 2017.